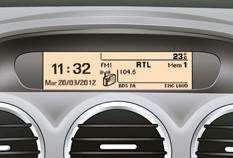 - screen display and vehicle equipment parameter setting menus. Press the buttons to select the menu required, then confirm by pressing the "OK" button. With the Peugeot Connect Sound (RD5) switched on, once this menu has been selected you can activate or deactivate the functions linked with use of the radio (RDS, REG, Radio Text), or CD (CD introscan, shuffl e, repeat). For more information on the "Audio functions"
application, refer to the Peugeot Connect Sound (RD5) section. Once this menu has been selected, you can consult information concerning the status of the vehicle, such as the alert log. Press the "MENU" button for access to the main menu. Press the arrows, then the "OK"
button to select the " Diagnosis vehicle " menu. Press the buttons, then the "OK" button to select the menu required. Press the buttons, then the "OK" button to select the "Guide-me-home headlamps" line. Press the buttons to set the value required (15, 30 or 60 seconds), then press the "OK" button to confirm. Press the buttons, then the "OK" button to select the "OK"
box and confirm or press the "ESC"
Once this menu has been selected, you can change the language used by the display (Deutsch, English, Espanol, Français, Italiano, Nederlands, Portugues, Portugues-Brasil, Russe, Türkçe * ). With the Peugeot Connect Sound (RD5) switched on, once this menu has been selected you can confi gure your Bluetooth system (pairing), consult the various telephone directories (calls log, services...) and manage your communications (pick up, hang up, call waiting, secret mode...). For more information on the "Telephone" application, refer to the Peugeot Connect Sound (RD5) section.